"Could you take me to Liverpool? 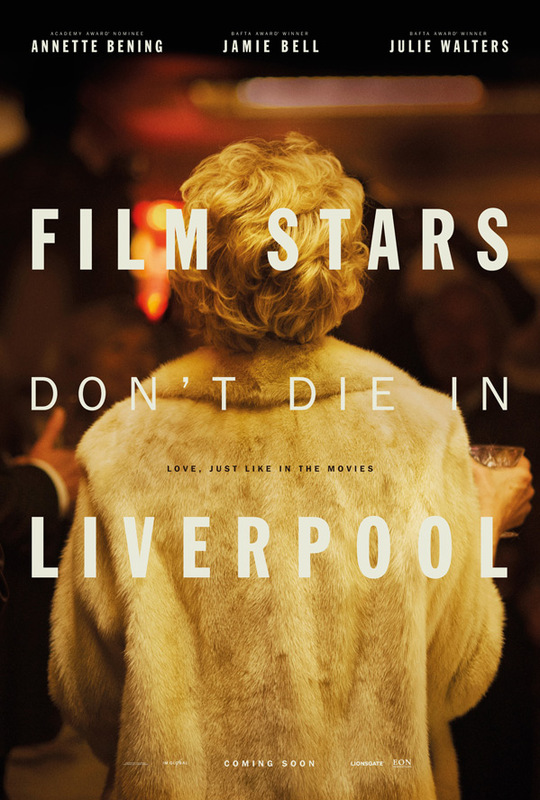 I could get better there…" Lionsgate UK has unveiled the first trailer for a film titled Film Stars Don't Die in Liverpool, which just premiered at the Telluride Film Festival this weekend to great reviews. It will play at TIFF next and the London Film Festival, too. The film tells the story of Academy Award-winning actress Gloria Grahame, as played by the ever-so-talented Annette Bening. It mainly focuses on her passionate romance with a much younger movie star named Peter Turner, as played by Jamie Bell, and it's based on Turner's actual memoir. The full cast includes Julie Walters, Vanessa Redgrave, Kenneth Cranham, Stephen Graham, and Frances Barber. Grahame starred in The Big Heat, It's a Wonderful Life, In a Lonely Place, and Oklahoma!, and won the Oscar for her role in The Bad and the Beautiful. Based on the early buzz, this is definitely a film to keep an eye on. Take a first look below. Liverpool, 1978: What starts as a vibrant affair between a legendary femme fatale and her young lover quickly grows into a deeper relationship, with Turner being the person Gloria turns to for comfort. Their passion and lust for life is tested to the limits by events beyond their control. Gloria Grahame was a Hollywood leading lady at the heart of several hit films from the Golden Age of Hollywood, including The Big Heat, It’s a Wonderful Life, In a Lonely Place, and Oklahoma! She won the Academy Award for Best Supporting Actress for her role in The Bad and the Beautiful. Film Stars Don't Die in Liverpool is directed by veteran Scottish filmmaker Paul McGuigan, of the films The Acid House, Wicker Park, Push, and Victor Frankenstein previously; as well as a few episodes of "Luke Cage" and other TV work. The screenplay is written by Matt Greenhalgh, adapted from Peter Turner's memoir of the same name. This will premiere at the Telluride, Toronto & London Film Festivals. Lionsgate will release Film Stars Don't Die in Liverpool in the UK in November, but it still doesn't have an official US release date yet. Stay tuned. First impression?